Race your family and friends to as many National Parks and Monuments as you can! Become a Ranger and challenge other players in this exciting game of strategy. Every move is packed with fun and facts about the most famous destinations in the American Southwest! Ages 8+, 2 - 6 players or teams. 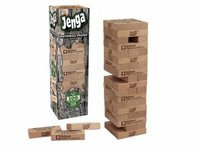 Celebrate America's national parks while you play JENGA, the classic block stacking game. Players remove and stack custom blocks, each featuring a fun fact about the national parks. Game includes over 100 facts. A portion of the purchase price of this game will be donated to the National Park Foundation, the official non-profit partner of the National Park Service. Plan a cross-country vacation and experience over 60 of the most beautiful and historic sites in America in this special National Parks Edition of MONOPOLY. Buy, sell, and trade the most beautiful and historic sites in America from the stunning landscape of the Grand Canyon to the awe inspiring wonder of Yellowstone. Also featured in the game are the animals that have captured our hearts and curiosity and call the national parks home., including the grizzly bear and the majestic bald eagle. This game is designed to give a fun and interactive learning experience! 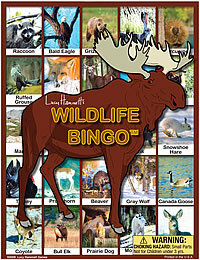 Beautiful photos of North American wildlife are printed on the bingo cards and game boards. Each of the 42 wildlife cards has a beautiful photograph of the animal on the front and informative text about the animal on the back. Be the first to cover the selected board game pattern and yell "BINGO" or "WAPITI" and you'll be crowned a winner. 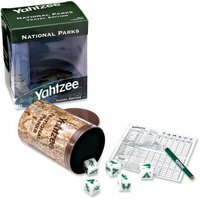 A must-have game for adventurers to play on the go, YAHTZEE®: National Parks Travel Edition brings your favorite National Parks to you! Shake up your tree trunk dice cup and roll three Cannons and two Trees – that's a Full House! And if you roll 5 Monuments, you've got YAHTZEE®! A great game for those who love National Parks or for those who want to learn more about them!